If you are having problems with your headlights cycling up and down when you operate them, the problem is most likely a dirty electrical contact wheel inside the headlight motor gear assembly. While the cycling normally occurs going from the raised position to lower position, it can also occur going from the lowered position to the raised position. The electrical contact wheel provides a continuous electrical flow path for the headlight motor to keep it energized when the headlight switch is operated. The only exception is two small plastic inserts into the wheel which break the electrical contact at the full up position and at the full down position. 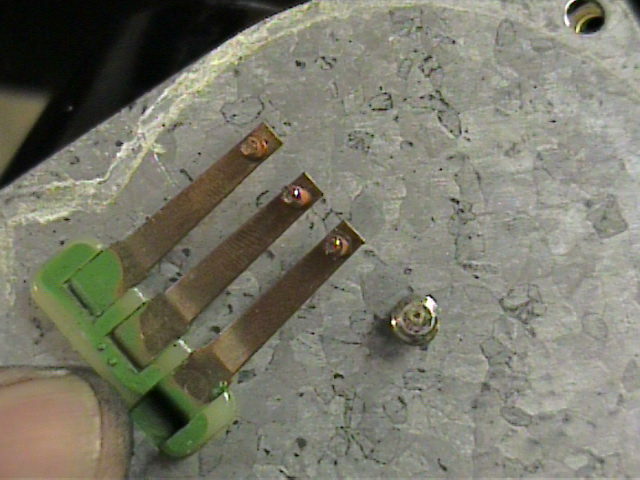 Over time, corrosion builds up on the contact wheel. The corrosion gets carried by the contacts onto the normally non-conducting plastic inserts on the wheel. 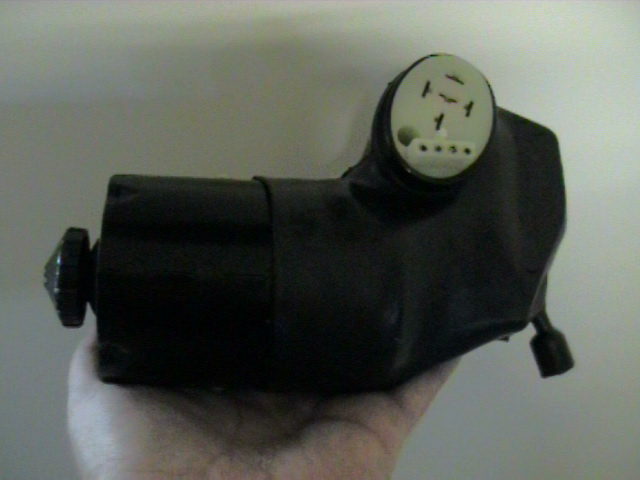 A film of corrosion eventually builds up on the inserts and they will conduct enough electricity to keep the motor energized and the headlights rotate up and down. 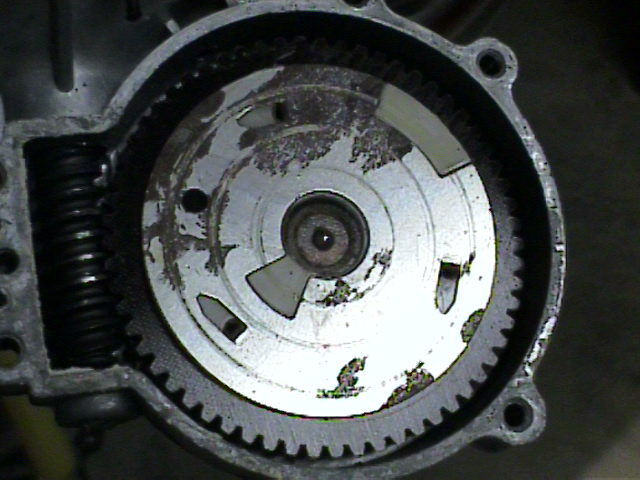 To correct the problem, the headlight motor has to be removed, the gear assembly cover removed, and the contact wheel cleaned. The following procedure will provide step-by-step instructions for removing and cleaning the headlight motor. 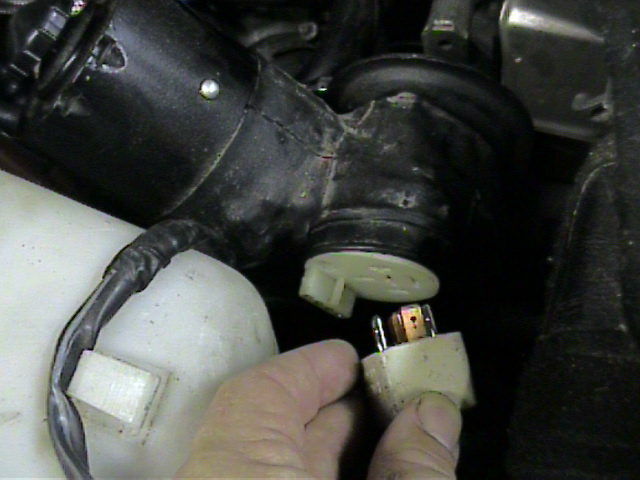 Disconnect the headlight motor electrical plug and remove relay. If the motor is equipped with a manual raising and lowering dial (some early cars are not), raise the headlight to the 1/2 to 3/4 raised position. This will make all of the motor mounting bolts easily accessible. Remove the bottom two 10mm bolts that hold the motor to the mounting bracket. Lower the headlights back to the full down position. 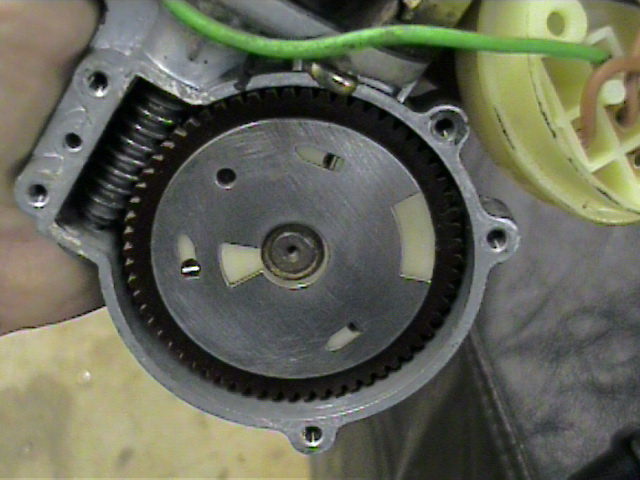 This is done to retain the motor-to-linkage alignment when the motor is removed. 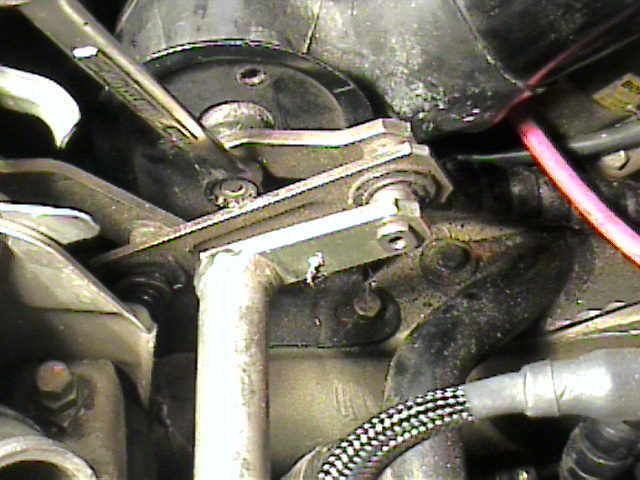 Remove the 13mm nut from the end of the drive shaft of the motor (that holds the headlight linkage to the motor shaft). Remove the remaining (top) 10mm bolt that holds the motor to the bracket. 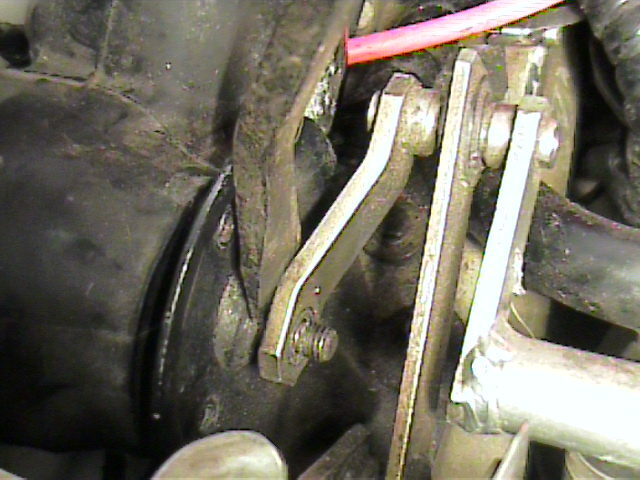 You'll probably have to use a flat tip screwdriver or pry bar to separate the linkage from the motor shaft. Once you're done remove the motor from the car. This is probably the hardest part of the whole job. 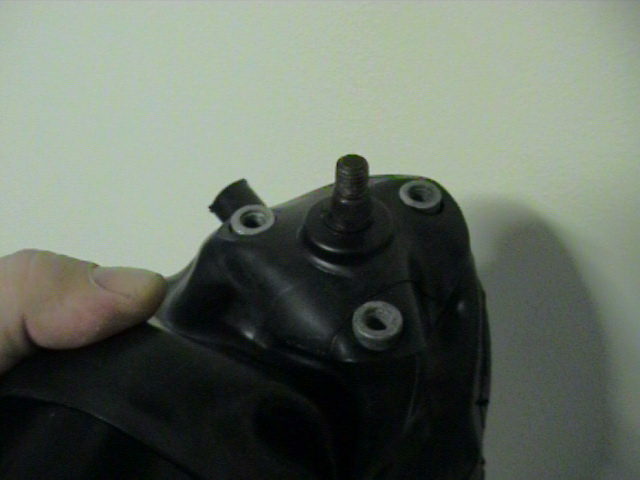 There's a rubber boot that covers the bottom of the motor and the gear housing that must be removed. Work it down off of the motor, around the bottom of the gear assembly, over the drive shaft in the back (that's the hard part), and finally off of the relay block. 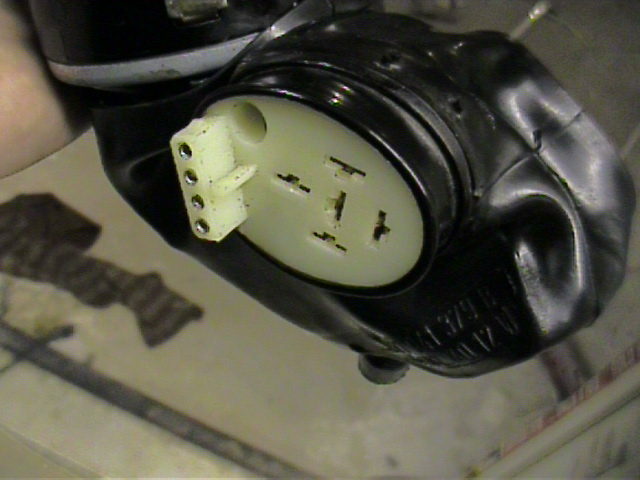 Work slowly and carefully and you can do this without damaging the boot. There are six flat head screws that hold the gear assembly cover. However, you can only see five of them as one is under the relay block. As you remove the screws pay careful attention to the location of each screw as they are different lengths. 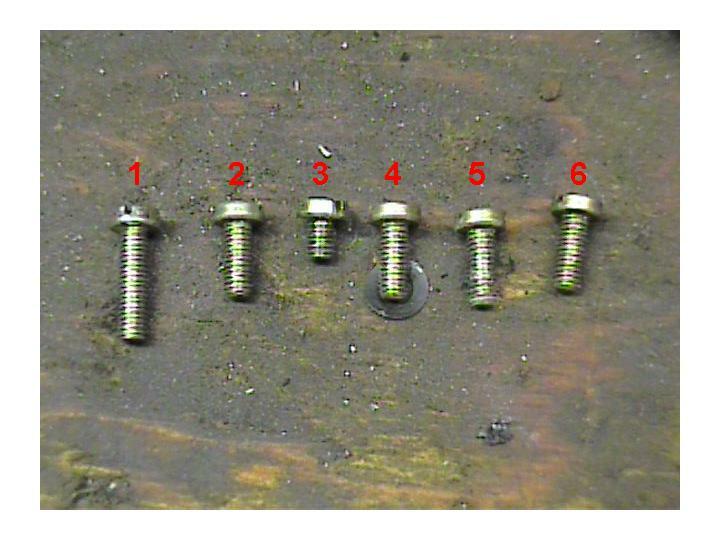 In the pictures below, you'll see the location of the six screws and the size of the screws that go in each location by the numbers. First remove the two screw that hold the relay block in place (one long, one short). Move the relay block out of the way and remove the screw underneath the block. Remove the remaining three screws. Remove the gear assembly cover carefully as there are electrical contacts on the back side of the cover. Be careful when you remove the cover as there is a small ball bearing in the center of the contact wheel. Remove that ball bearing and set it to one side so you don't lose it. Behind the cover, you'll find the contact wheel which will probably be pretty dirty. You'll see two plastic areas on the wheel and several plastic tabs which hold the wheel to the large gear behind it. Clean the gear with steel wool, emery cloth, or fine grit sandpaper. My contact wheel was pretty dirty and steel wool didn't work too well. I recommend 440 grit sandpaper but, I had to use 220 grit paper because that's all I had. If you use 220 grit paper just sand lightly and don't get too aggressive. Blow all of the debris out of the gear assembly when you're done cleaning the wheel. Install the gear assembly cover and relay block. Again, make sure that the different length screws are in their correct positions. Here's the second hardest part of the job. 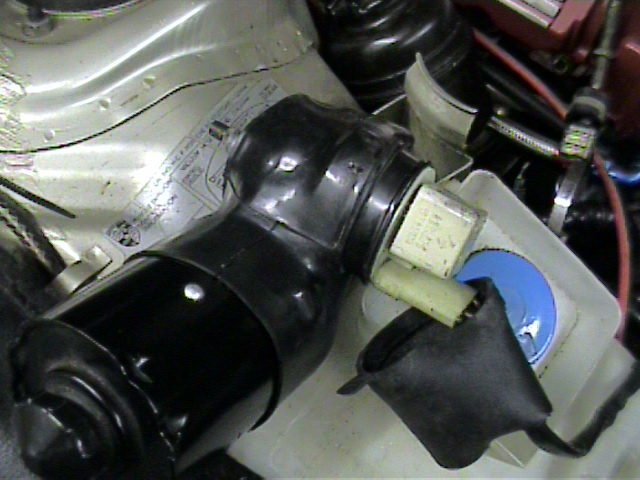 Install the rubber boot back onto the motor assembly. Place the boot over the relay block first and then slowly work it over the gear assembly. The hardest part is getting the boot over the gear assembly drive shaft. The easiest way I've found to do this is to stick two fingers inside the boot as you're working it over the gear assembly, placing them on either side of the gear assembly shaft, and pull the boot up and over shaft. You'll have to do this several times to basically "walk" the boot until it reaches the shaft opening in the boot. Before installing the motor install the relay and electrical plug and set the motor somewhere (on top of the washer reservoir is a good spot) where the motor shaft isn't touching anything. Then temporarily reconnect the battery. This will reset the motor back to the fully lowered position in case it moved during cleaning. Then disconnect the battery and motor electrical plug and relay. 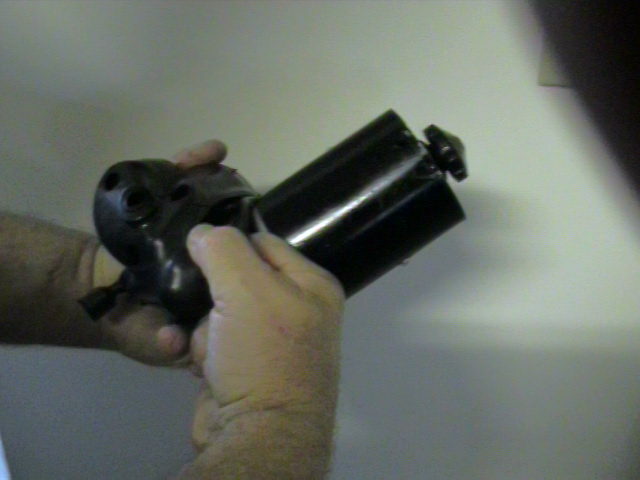 Install the motor back to the mounting bracket. 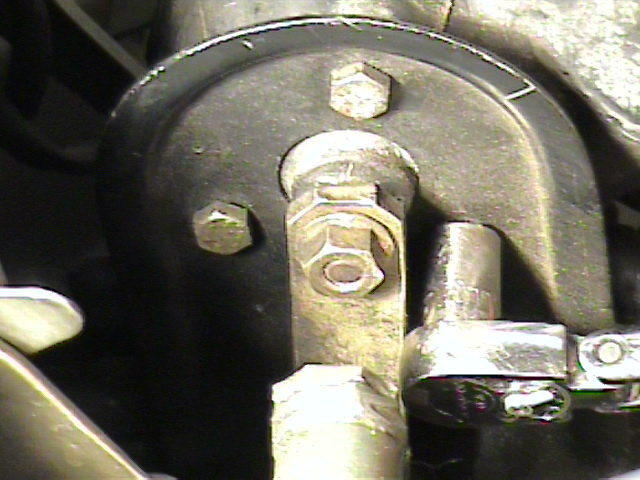 Install the top 10mm bolt and the bottom front bolt (but do not fully tighten) without moving the linkage. The bottom one is tough but, this ensures that the motor is in proper alignment with the linkage. Next, install the 13mm bolt that holds the linkage to the motor shaft and tighten. 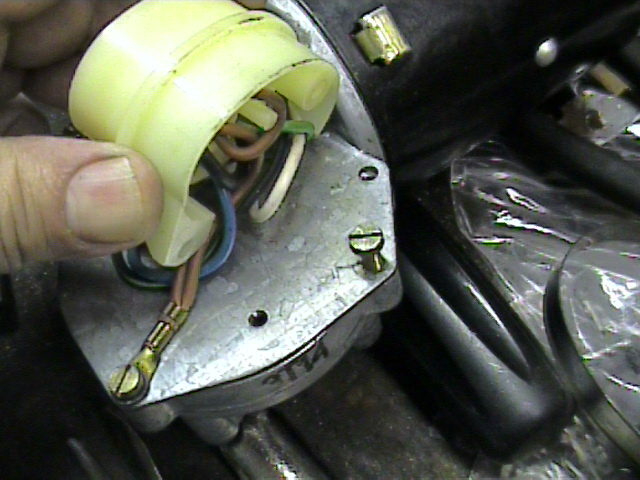 Using the knob on top of the motor, rotate the headlights to the 1/2 to 3/4 raised position. This will facilitate installing the bottom rear motor mounting bolt (10mm). Tighten all of the motor mounting bolts and lower the headlights to the full down position. As a side note, during manipulation of the headlights, it's a very good time to lubricate the linkage. 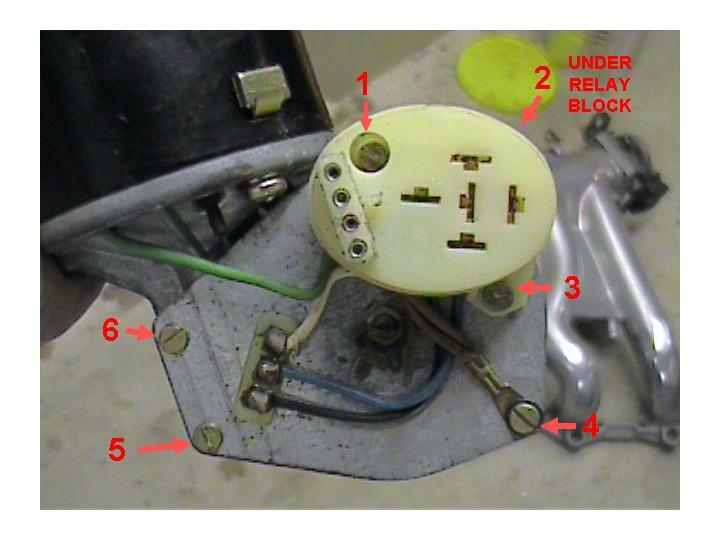 Plug in the relay and motor electrical plug. Test the headlights to make sure they are operating properly.